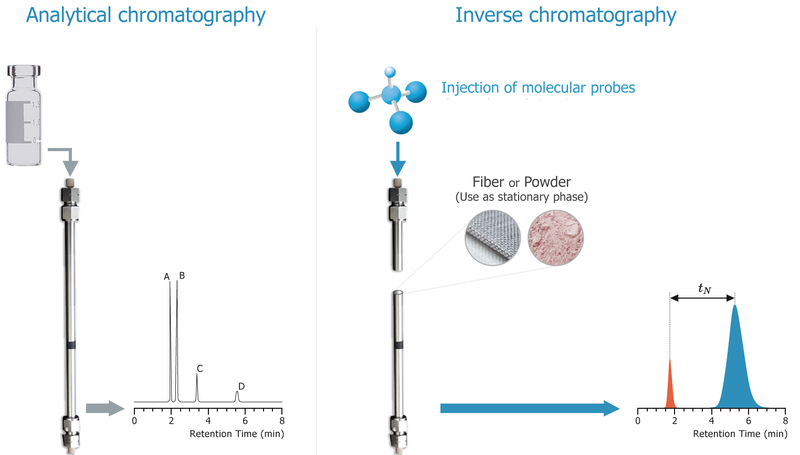 Interfacial Chromatography, IGC, features basically the same setup as normal GC, but the surface of the column material itself is analysed. This is the inverse of normal GC mode and is not so easy to grasp. The IGC apps explain the basics and help you to understand the principles and explore the full potential of the method. The technique has historically been called Inverse Gas Chromatography, but defining a technique by a negative doesn't seem to me to be helpful. Because, also, superior IGC equipment and techniques are now available, it is time that the technique got a new name to reflect its greatly improved capabilities. I know that all GC techniques are "interfacial" but IGC deserves the word because that (unlike the others) is its focus. In GC a known column material is challenged with a set of molecules in the gas phase and their retention times are of no great intrinsic importance - the idea is to get a unique peak for each molecule so that, for analytical purposes, the relative amounts of each molecule can be analysed. But for IGC the injected samples are known, relatively simple molecules, which are injected one at a time, and the unknown is the column material. The retention times are of great importance because these allow the thermodynamics of the probe/column interaction to be evaluated. where R is the universal gas constant and Tm is converted from °C to K.
Because ln(1)=0 any probe molecule coming out with Vg=1 has ΔG=0, i.e. no interaction with the solid maerial, i.e. no free energy of adsorption. The apps show a variety of measurements that can be made using this basic IGC principle. The simpler ones just use alkanes as reference probes to obtain the dispersive surface energy. The more complex ones use a good variety of probe molecules to get more information about the nature of the surface as morphology, specific polar interaction, acid/base characteristics or even Hansen Solubility Parameters. IGC is an unique technique to obtain the real interaction potential of surfaces, but there are also certain pitfalls. For example for most testings the operating conditions should be under "infinite" diluted conditions, i.e. the peak is symmetric and the retention time should not depend upon the actual quantity of the probe molecule. This and other typical limitations and pitfalls are remarked under the specific sections. The IGC apps are based on the inputs kindly provided by Dr Eric Brendlé of Adscientis who are specialists in IGC measurements. The images are also courtesy of Adscientis.